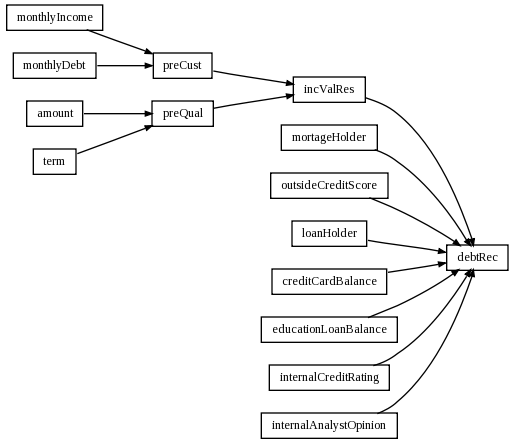 This is an example of a system which computes cutomer's credit rating. It takes into account a few parameters describing customer status and computes his status in two stages. Firstly it does a preliminary check using customer's base financial parameters and if he passes this test his financial status will be analyzed more thoroughly. Examination of customer's credit rating begin with checking if his income multiplied by a certain coefficient is higher than his monthly instalments. Modeling this inequality in HeKatE methodology requires computing both sides of this inequality and comparing them in next table. If that condition is met, control should be passed to another system. Additional checks will be performed there, taking into account additional customer data. Empty cells in decision table will not have influence on the final decision. Conceptual model design starts with Loan attribute. It is finalized to four conceptual attributes and one phisical - debtRec. This attribute is system output (final credit rating). On level 2 we can see that debtRec directly depends on IncVal and LoanReq. IncVal represents customer data needed to check inequality CusDa and loan data LoanDa. Attribute LoanReq contains informations necessary to final veryfication of customer's credit rading. Level 3 and 4 finalizes all conceptual attributes together with all relations between them. Comparing XTT table prototype with XTT logic model we can see some differences. Tables created from LoanDa and CusDa conceptual attributes were merged into one table. It happend because both tables were used to compute value of single inequality. Unfortunatelly there is no possibility to design ARD diagram in such way that there will be two attributes on action side. Table, where both sides of inequality are compared was also modified. In order to compare two attributes one of them must be in table header, second - written in table cell with its operator.